With those three words, Vice President Joe Biden ended months of speculation about his political future. The Vice President concluded that he and his family are still grieving over the recent death of his grown son, Beau. And that prevents him from starting a presidential campaign, he said. 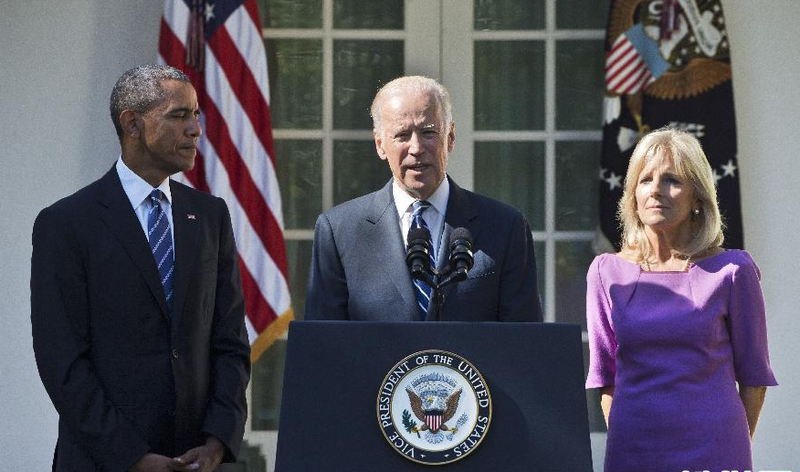 With his wife, Jill Biden, to his left, and President Barack Obama to his right, Mr. Biden stepped into the Rose Garden of the White House. He announced that he will not be a candidate for President in 2016. As lesser-known candidates like Bernie Sanders, Jim Webb and Martin O'Malley challenged Hillary Clinton for the Democratic nomination, the 72-year-old Vice President chose to wait. He has sought the nomination for president twice before without success. In 2009, Biden became Vice President, the second-highest office in the U.S. He was elected on the same ticket with President Barack Obama. At the age of 29, Joseph Biden was elected to the U.S. Senate. He represented the state of Delaware for 36 years. Just weeks after winning the Senate seat in 1972, Biden's wife, Neilia, and 1-year-old daughter, Naomi, were killed in a car accident. Tragedy struck the Biden family again in May this year. His son, Beau Biden, died after battling brain cancer. The death of his son brought an outpouring of support across the nation. On the campaign, front-runner Hillary Clinton faces criticism about using a private email server when she was Secretary of State. And Senator Bernie Sanders is drawing large crowds across the nation. Many in the Democratic Party think that Sanders is too liberal. They say he cannot win in the general election. In his Rose Garden speech that hailed middle-class America, Biden said that the "window" has closed for him on "mounting a realistic campaign." The Governor is going to run for the Senate after this term. As a matter of fact, this was purely newspaper gossip and speculation. The radio trumpeted the presidential campaign across the country. Many other lesser-known figures have punctuated English literature as well. 1.With his wife, Jill Biden, to his left, and President Barack Obama to his right, Mr. Biden stepped into the Rose Garden of the White House. He announced that he will not be a candidate for President in 2016. The dean called us to step into his office. 2.In his Rose Garden speech that hailed middle-class America, Biden said that the "window" has closed for him on "mounting a realistic campaign." Even middle-class consumers in the U.S.are beginning to kick against the runaway prices. Most come from middle-class families in the big urban centers of China.